Every Valentine’s Day my husband comes home from work hiding plastic grocery store bags behind his back and he goes into our bedroom and closes the door. The girls use to run up to him when he got home, but now they are teens and are usually upstairs hanging out and don’t notice. 5 minutes later he comes out and asks me where the girls are. 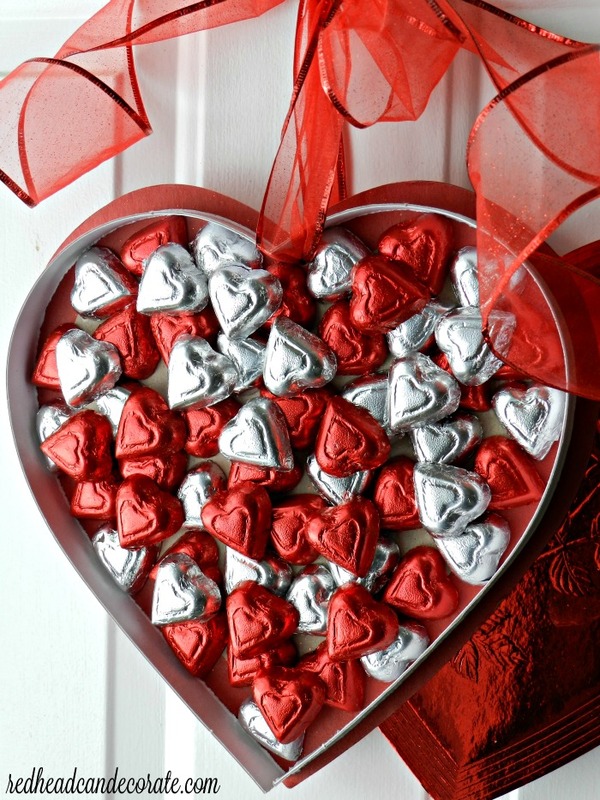 He then calls them down, and hands them each their own large red foil heart Valentine’s Day chocolate candy box. Not only that…but he gives them a hug and a kiss, and even a card. I sit back and watch and enjoy the show, just being thankful for this man, and our girls. Then, a couple weeks later I have 2 large red foil heart Valentine’s Day boxes that I hate to throw away because they are so pretty, and special. Have you ever noticed? The shiny red heart box is so beautiful and most people just throw it way, or forget about it. Not this lady. It looks so adorable on our front door…even in the cold. I was afraid the bitter cold temps would make the hearts fall off, but I think it made them even stronger. They are frozen there. I’ll have to be careful when it defrosts because they are chocolate. That reminds me…If you live in a warmer climate, don’t let the chocolate get warmer that 65 degrees or so, and keep this out of direct sunlight. Otherwise, you’ll have to use acrylic hearts. Once you have your empty heart shaped chocolate box, take off the top heart and flip it around so the red foil is showing. Then glue the empty bottom heart to the top like shown in the photo. 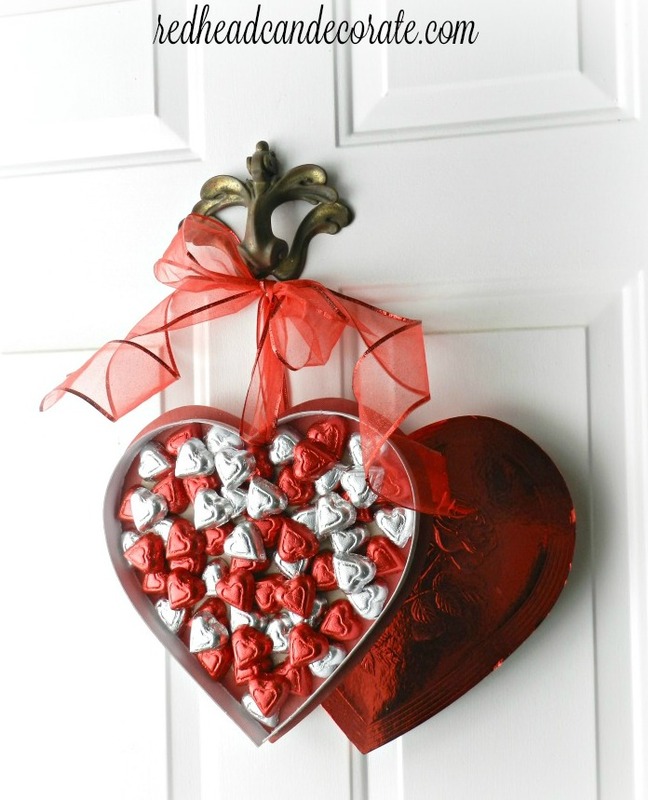 Then place your chocolate foil hearts in box with a little glue. 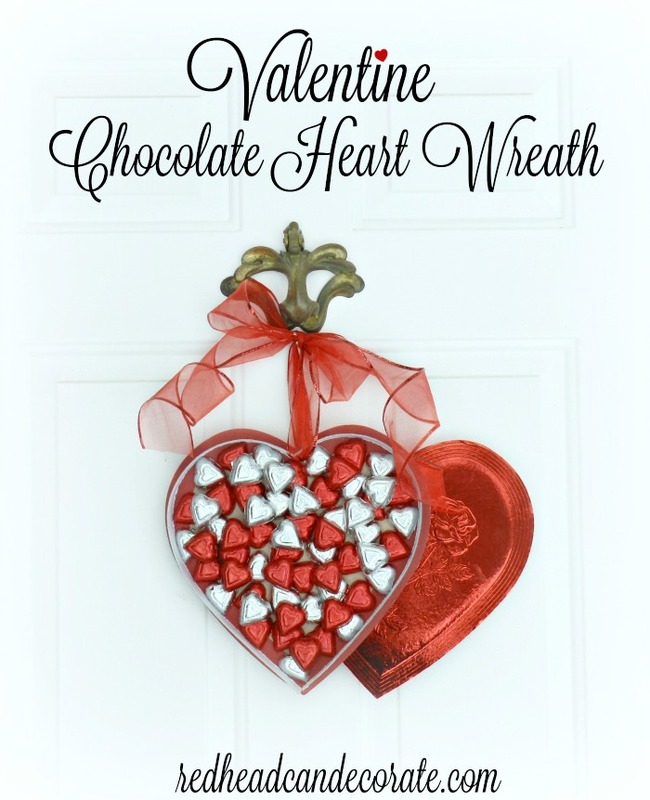 I found my chocolate hearts at the dollar store and I bought 6 bags. I also layered my hearts for a prettier look. Lastly, screw a hole into both boxes to put the ribbon through so you can hang it on your door. Remember not to hang or store in temperatures above 65 degrees. 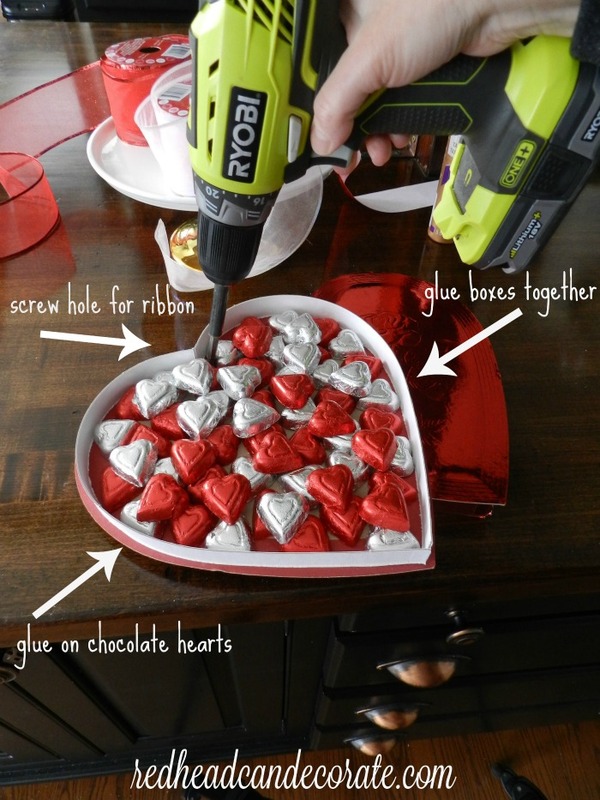 If that’s not possible, you could use acrylic hearts. Oh my goodness, so cute!! I’ve always thought those candy boxes were too pretty to throw away. What a creative way to re-feature them! Gorgeous, fabulous, great idea, and very creative. I love it! Wow!!! I love this! My daughter loves keeping her chocolate boxes from her dad. I’m going to show her this and have a craft night with her. I still have my box from last year. It’s hanging on my craft room wall. Why couldn’t I get ideas like this? But I know exactly what I’m going to do. It’s the first one my honey bought me and very special! Thanks! I love it!